For example, an authentication provider may be oauth, using Flask-OAuth and the user information may be stored in a relational database. Looseness of the framework is provided by using signals as the interface. 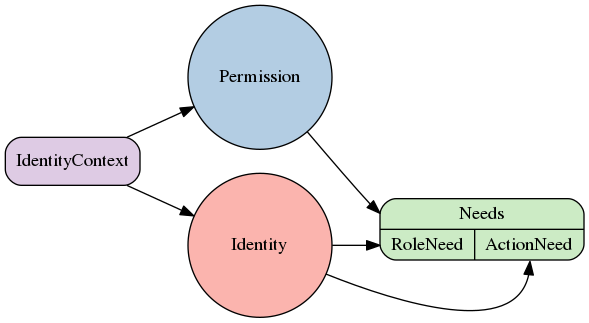 The Identity represents the user, and is stored/loaded from various locations (eg session) for each request. The Identity is the user’s avatar to the system. It contains the access rights that the user has. A Need is the smallest grain of access control, and represents a specific parameter for the situation. For example “has the admin role”, “can edit blog posts”. Needs are any tuple, or probably could be object you like, but a tuple fits perfectly. The predesigned Need types (for saving your typing) are either pairs of (method, value) where method is used to specify common things such as “role” , “user” , etc. And the value is the value. An example of such is (‘role’, ‘admin’) . Which would be a Need for a admin role. Or Triples for use-cases such as “The permission to edit a particular instance of an object or row”, which might be represented as the triple (‘article’, ‘edit’, 46) , where 46 is the key/ID for that row/object. Essentially, how and what Needs are is very much down to the user, and is designed loosely so that any effect can be achieved by using custom instances as Needs. Whilst a Need is a permission to access a resource, an Identity should provide a set of Needs that it has access to. A Permission is a set of requirements, any of which should be present for access to a resource. An IdentityContext is the context of a certain identity against a certain Permission. It can be used as a context manager, or a decorator. # Create a permission with a single Need, in this case a RoleNeed. Signal sent when the identity for a request has been changed. Signal sent when the identity has been initialised for a request.